With a stay at Howard Plaza Hotel Kaohsiung in Kaohsiung (Sinsing District), you'll be within a 15-minute drive of Kaohsiung Museum of Fine Arts and Dome of Light. Featured amenities include a business center, dry cleaning/laundry services, and luggage storage. Event facilities at this hotel consist of conference space and meeting rooms. A roundtrip airport shuttle is provided for a surcharge (available 24 hours), and free self parking is available onsite. Located in Dongshan, Skylight Maple Springs Bed and Breakfast is convenient to Luodong Sports Park and Beicheng Tian Jhu Church. Self parking (subject to charges) is available onsite. With a stay at Come Inn Taipei 3 in Taipei (Songshan), you'll be a 2-minute drive from Baby Boss and 9 minutes from Sun Yat-Sen Memorial Hall. 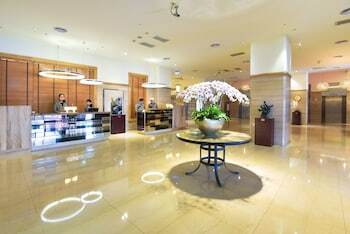 Located in Taipei (Datong), The Dealer Hotel is within a 10-minute drive of National Taiwan Museum and Longshan Temple. With a stay at Youyou Tainan B&B in Tainan (Tainan City Centre), you'll be minutes from Great South Gate of Taiwan Fucheng and Wufei Temple. With a stay at 85 Green World 85 Building Museum in Kaohsiung (Kaohsiung City Centre), you'll be minutes from Tuntex Sky Tower and Kaohsiung Public Library. With a stay at WE Motel in Kaohsiung (Sanmin), you'll be within a 15-minute drive of Kaohsiung Museum of Fine Arts and Love River. Free self parking is available onsite.